I don’t really know if the Brill Building gents really spoke like this, with enthusiastic expletives redacted here, but it pleases me to imagine rather cynical craftspeople turning out popular art that charms me still, eighty years later. 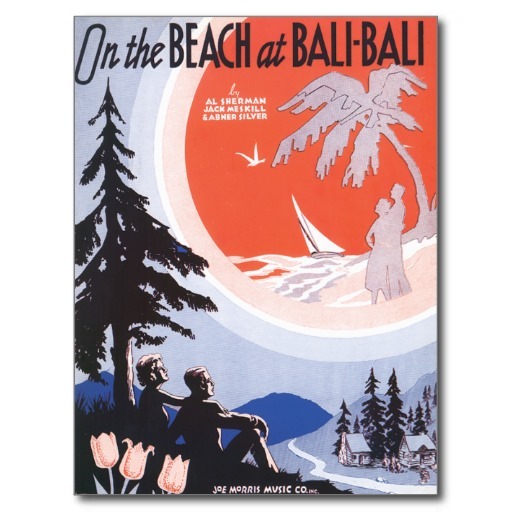 And the mixing of genres on the sheet music cover is most remarkable, but I gather that the couple is enjoying the tulips and their cottage while recalling those tropical moments . . .
What happens after the vocal is wonderful — a mixture of timbres and approaches beginning with a trumpet solo that could and should have gone on for years. One of the many times I’ve felt, “That record is too short!” But what a joy to have it — with Tab Smith and a very sedate J.C. Higginbotham. What’s the sermon or the lesson? Great musicians transform ordinary material with memorable results.